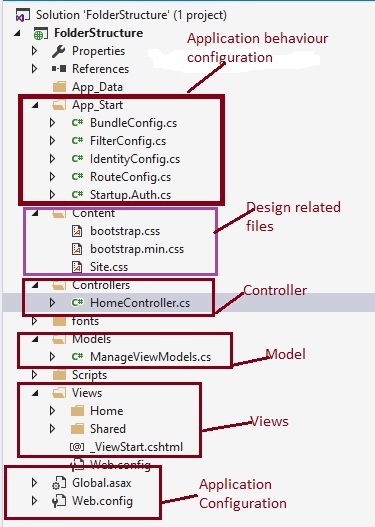 Day by day ASP.NET MVC becomes the popular framework among the developers because of clean code and folder structure.In this first article of ASP.NET MVC articles series we will understand folder structure of ASP.NET MVC application. avoid having to configure and specify things that can be inferred based on convention by adding code through Scaffolding . 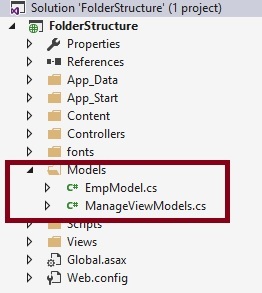 For instance, MVC uses a convention-based directory-naming structure when resolving View templates and this convention allows you to omit the location path when referencing views from within a Controller class. MVC is designed around some sensible convention-based defaults that can be overridden as needed. This concept is commonly referred to as "convention over configuration" which popular concepts of Ruby on Rails programming language. Each controller name ends with suffix controller. 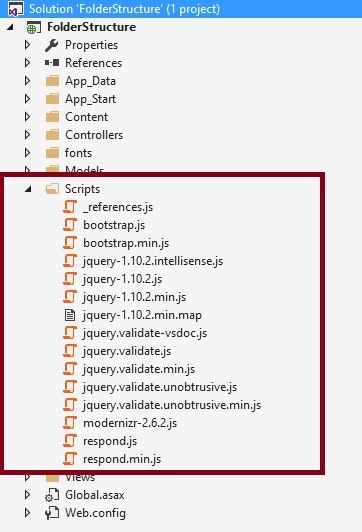 The single view directory can be used for entire application. By default all directories (folder) created with name of controller name. 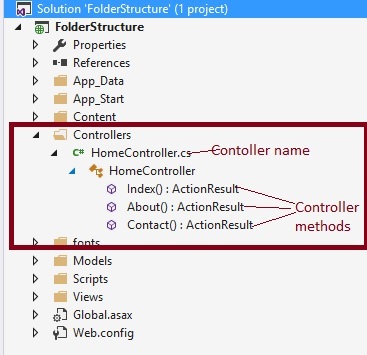 Let's add the ASP.NET MVC application so it will create folder structure under the project solution explorer. This folder contains the controller and their methods. The controller is responsible for processing the user request and return output. This folder contains the class files for entities or properties used to store the input values. 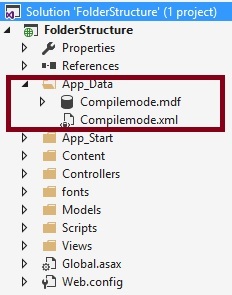 You can rename the folder Model and you can give any name as you wish ,its not mandatory that the folder name should be Models however model name is only for better naming conventions . also Model can be created in separate class library project . 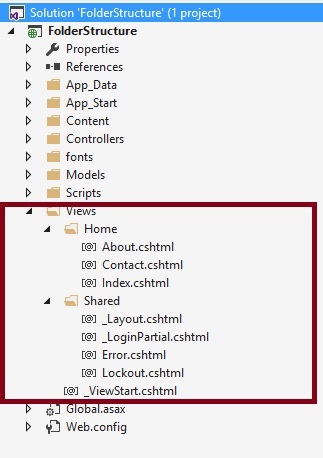 This folder contains the UI pages including shared page, .CSHTMl, .VBHTML, HTML,aspx pages that show the output to the end user. 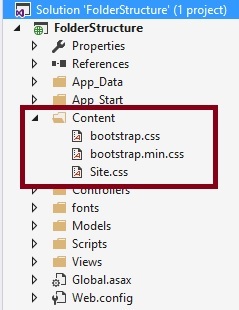 This folder is used to store files related to design and UI such as CSS files ,images which is require for UI..
From preceding example we have learned how the folder structure architectures and use of each folder. Its not mandatory that you should use above folder structure and naming conventions, You can rename it and follow different folder structure as you wish. To learn more about MVC basic in terms of to understand preceding folder structure practically please refer following videos series.